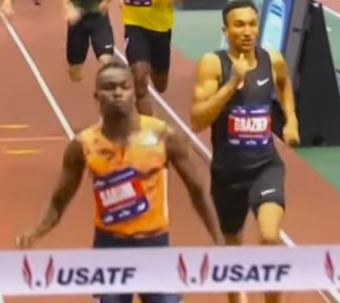 Last year Donavan Brazier was quite close to breaking the American indoor record, but at the end of the indoor season Johnny Gray's 1:45.00, set in 1992, still stood. At the Millrose Games Donavan was determined to finally break that mark. After two laps the pace was breathtaking: 49.70 for the first half of the race. Brazier powered on during lap three but in his wake talented Kenyan Michael Saruni was still within striking distance. And in the final lap Saruni streaked ahead and finished in a fantastic 1:43.98, becoming the second fastest indoor 800m runner ever. In 1997 Wilson Kipketer set two incredible World Indoor records. All of 22 years later Saruni has become the second athlete to run below 1:44 indoors. Brazier's run was almost as impressive: he did succeed in breaking the American record, by almost six tenths of a second. He is now fifth on the all time world Indoor list. Incredible pace! At the Millrose Games Michael Saruni became the second fastest athlete ever indoors. Behind him Donavan Brazier finally beat Johnny Gray's 27 year old American Indoor record. 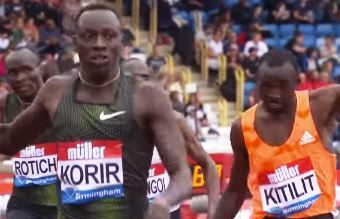 Emmanuel Korir is already a major force at the 800m. In Birmingham he showed that he can dominate races like few others can. He ran away from the field and made it look easy. Earlier this season Korir ran the fastest time of the season. In Birmingham he apparently wanted to show that had been no fluke. On he final straight he had to battle it out with Jonathan Kitilit - who is having a splendid season himself. This race would be Jonathans sixth 1:43 mark already - no one else this season has been able to run three, let alone six. But where Kitilit was struggling Korir was floating. With every stride he gained on Kitilit, and at the finish he was well ahead. On top of that he managed to run another 1:42 mark, his second of the season. To indicate how rare that is, consider that all the other runners in this race have just managed two 1:42 marks between them in their entire careers (one by Cheruiyot, one by Murphy). Korir will surely win major titles at the 800m soon. And another! Emmanuel Korir triumphs once more in yet another time below 1:43. His victory in Birmingham broke the meeting record with more than a second.